The Victory hosta is the 2015 Hosta of the Year. 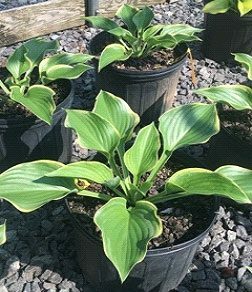 It’s categorized as a giant hosta due to its size. Featuring heart-shaped green leaves with gold borders, It can grow to approximately 35 inches tall by 70 inches wide. Lavender flowers bloom from June to September. They grow on stems that can reach heights of up to seven feet. Victory is a sturdy plant with thick, wide leaves that can withstand harsher weather. Plant it in areas with full sun or half sun and shade. Check the soil to make sure it’s moist and water it regularly.